Japan's first commercial jet in half a century made its maiden flight on Wednesday, in a breakthrough for the country's long-held ambition to establish an aircraft industry that can compete with the world’s major aircraft builders. The Mitsubishi Regional Jet (MRJ) took off on a one-hour return flight from Nagoya Airport to test Mitsubishi Aircraft Corp's ability to bring the 100-seat class plane into service after three years of delays, Reuters reported. The $47-million carbon-composite regional jet is Japan’s first commercial passenger aircraft since the 64-seat YS-11 entered service 50 years ago. 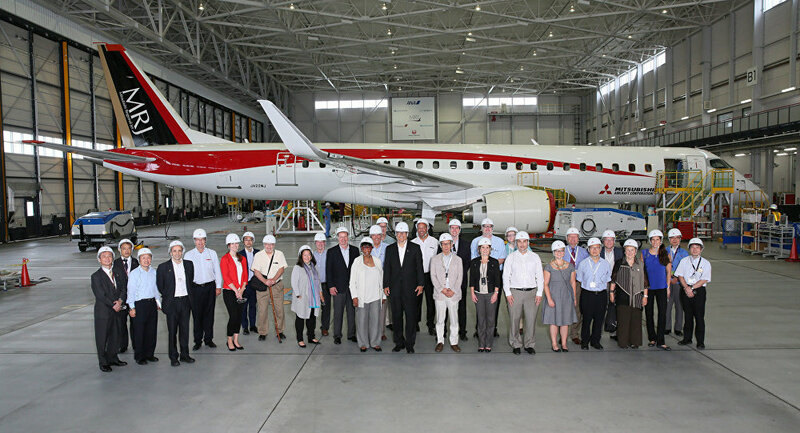 Mitsubishi Heavy Industries, a military contractor best known for its “Zero” World War II fighter, pulled back the curtain on the fuel-efficient, next-generation MRG that claims to offer more passenger comfort with lower operating costs in October 2014. The aircraft, which can seat as many as 92 people, offers more headroom than similar planes. At 2.03 meters, it narrowly edges out the 2 meters for the 88-seater Embraer E175 and the 1.89 meters for the 90-seater Bombardier CRJ900. The plane’s maximum range is 3,700 kilometers. Japan's last attempt to establish itself as a commercial aircraft maker ended in failure. Production of the YS-11, built by a consortium that included Mitsubishi Heavy, finished after only 182 planes were built.